Heir to Despair is vintage old-school black metal. Plus it really isn’t vintage old-school black metal. Listen for yourself and you’ll understand. Since their genesis before 1990, Sigh were known traditionally as the first ever Japanese black metal band. And it’s relatively important to clarify that this refers to pre-second-wave black metal: Think less of Emperor and more of Celtic Frost. 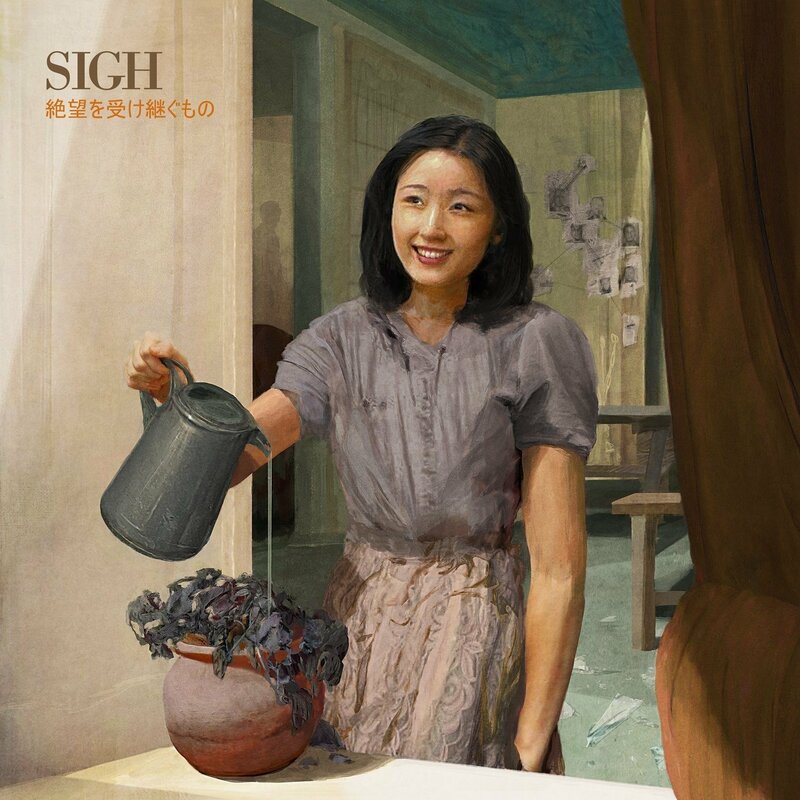 Long term fans of Sigh will no doubt find this record a nourishing addition to the band’s catalog. But it isn’t entirely necessary to analyse their previous merits. A frank lack of knowledge in who and what Sigh are is part of the fun of diving into an album like this. It’s 2018, and it’s not on Sigh‘s agenda to try to be relevant. It’s on Sigh‘s agenda to be as enjoyably off-the-wall as possible. In the first moments of the opening track “Aletheia”, one can hear the old school black metal influence with such potency, it’s forgivable to think that this album was actually made in 1990. But a whole swathe of other bits come in too, including sitars, flutes, and a comical jazzy outro. And so the basic premise of the album is set, if ‘basic premise’ is indeed the right way to put it. As a matter of principle, Heir to Despair teeters between traditional and so not traditional, and ultimately does everything to avoid being cliche whilst also being markedly conventional. It’s the kind of head-bending fusion of principles which comes alongside three decades of track experience. Up until a certain point, that is. Just when listeners are granted a fair sense of direction, tracks “Heresy I” to .”..III…” emerge from the swamp to fire all preconceptions into oblivion. The opening seconds of “Heresy I- Oblivium” sound more like Orbital‘s most recent album than anything black metal or progressive. And from this, the track morphs into a chuggy industrial metal number that may sound more familiar to the Quake II players of yesteryear. By the time the flutes, melodies, and harmonious vocals kick in, it’s probably best to stop making genre comparisons and enjoy the music. If your musical safety levels are tested at this point, it’s probably best to skip the second installment of this segment altogether. In fact, if that’s your disposition, you’d better just skip the whole thing. Failing that, it should be hard for you to resist the fantastical pull of this album. Heir to Despair is out of this world, energetic, and consistent in its conviction. The first and second waves of black metal are loaded with copycats. But just try to make an album like this! You’ll find the task rather impossible. To suddenly dive sideways for an entire act is an admirable move at the most avant-garde of times. In the more obscure realms of music, the odd dissident is surely a welcome presence, particularly ones who are proud enough of their reputation to take those kinds of risks. It’s good fun in any case. Next PostFour Stroke Baron - "Planet Silver Screen"